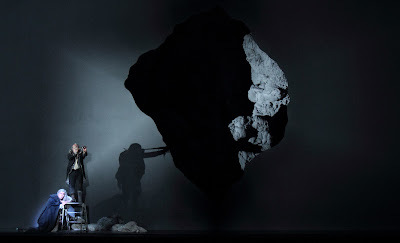 Daniel Kramer’s new production of Wagner’s Tristan and Isolde – his first production for ENO since being named its new artistic director – is not good. It’s not terrible. It’s not a hilariously, godawfully bad staging. But it’s really not good either. The sort of not-goodness it is is the choppy sort. The Orchestra, conducted by Edward Garner, is outstanding. Really beautiful. The lushness and lyricism of the music retains a kind of crisp exterior, rather than collapsing into the always-possible syrupy mess. And, actually, Tristan, sung by Stuart Skelton is very fine. So, if the music is – on the whole – pretty damn good, what’s the problem? Then there are the costumes (Christina Cunningham – who, judging by the eminently sane rest-of-her-CV, was ‘only following orders’ here). These are a whole new world of pain and confusion. Cornish knight Tristan is here rendered as a cartoon samurai from the 80s, inexplicably crossed with a teletubbie (he really does seem to have a little shiny screen in his tummy!). The Irish princess Isolde, looks like maybe a refugee from the Mikado, but one who’s been somehow entrapped in a scratch performance of Marie Antoinette. To this end, during Act 1 she straps on two of those crinoline things to support a giant bustle-y skirt jutting out miles on either side of her. So much so, that it looks like she’s riding a little hippo draped in a spangly cloth side-saddle by the time she’s finished. Their servants appear to have also been sipping Les Kool-Aid Dangereuses, but during a singalonga performance of The Rocky Horror Picture Show. None of this *need* be a problem, but it all sits there, in front of the silly set, looking absurd and communicating absolutely nothing about itself. Still, if you ever wanted to know what a watered down version of Robert Wilson’s Rocky Horror Show set before the French Revolution would be like, it’s pretty much this. But I should stop being sniffy. Act 4 is actually quite interesting, design-wise. The idea of setting the end of Tristan and Isolde in a kind of Beckett-land, with both Tristan and his servant now done up like post-apocalyptic tramps isn’t *the absolute worst*. (*Actually*, given the tatters of their Les Liasons Dangereuses costumes, this is more Heiner Müller’s Quartett than Waiting For Isolde.) But again, rather than feeling exciting or revelatory as design, thinking and direction, it simply feels random. I should re-state that none of these criticisms are “in principle”; I’m not one of the anti-regietheater brigade by any stretch of the imagination, but, like anything, there can be atrocious examples of the species, and this is one. The main problem in Act 4 is that the set actually conspires to make the singing in last bit of music, the most famous bit of music in Tristan and Isolde, *actually inaudible*. Which is, y’know, an issue.